The past month has been a whirlwind of events! 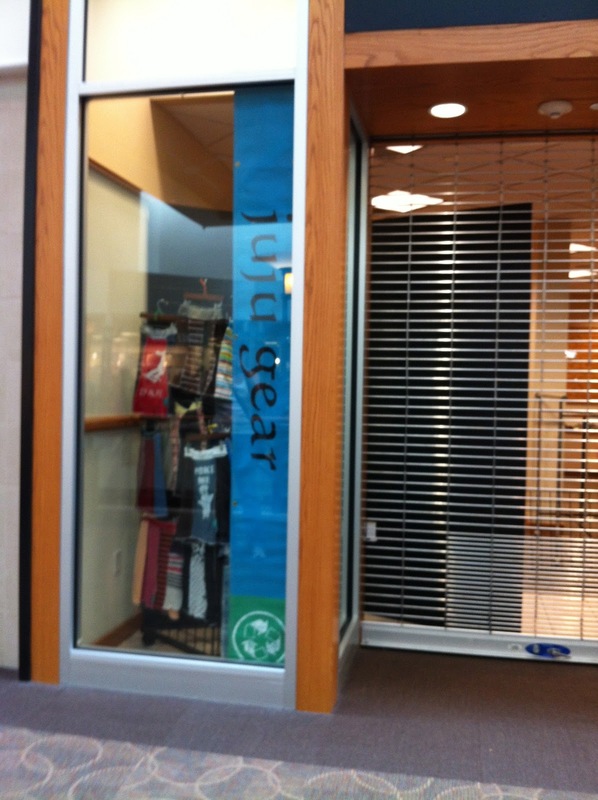 I am still working at the JuJu Gear store at Eden Prairie Center. In addition to the store, I have been doing craft and trade shows on behalf of JuJu Gear. The great news is that we are spreading good JuJu all around and gaining new fans each week! 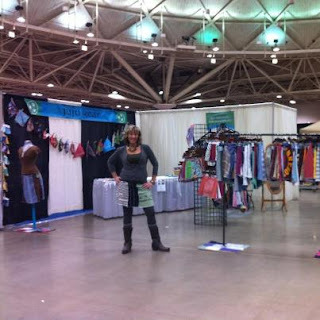 A few weeks ago I was a craft show in Maple Grove and this past week I was at the Twin Cities Women's Expo at the Minneapolis Convention Center. It is so much fun to introduce people to our fun skirts! 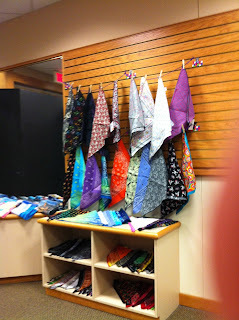 Next up I will be at the big craft sale at Canterbury in Shakopee in April. The news of JuJu is definitely spreading. Today I dropped off the application to be in Art on the Lake in Excelsior and the woman said, "oh, are you part of those super cute JuJu skirts?" I was wearing one at the time and she was so excited. Can't wait to keep riding the JuJu train and see all of the exciting places it takes me!! Becca went to Sweetheart's Dance a few weeks ago. She was lovely in her dress. Erick and I went together to take the pictures. It was so much fun to see all the kids dressed up and having a great time. Next week Bella goes to her survival camp for 4 days with her school. She did great last year, with the support of her great teacher. It was a good opportunity for her to be independent and handle her equipment by herself. She is getting good at it and like last year, I am packing a picture book on what steps need to be followed daily. The biggest issues for Bella are how to put the disposable batteries in since we don't use those on a daily basis. Also she needs to be reminded on when to change them. She is super excited to go on the trip. I will miss her tons, but it is a great chance for me to catch up on things around the house, while also having some fun downtime. With the cold temps, we have been enjoying some time indoors. On Monday, I just couldn't bring myself to load Bella in the car for swim team. Yesterday, Bella asked if we were going to swimming and I said, "yes, of course." She said it was too cold outside and I said, "Bella, yesterday was cold. Today it is 2 degrees. We are going." Today it is forecasted to be 11 degrees. I am going to resist the urge to put on capris. Next week, Bella celebrates her 11th birthday on the 29th. I can't believe it. Through all the ups and downs with her over the years, I am amazed at what she has accomplished. As Taylor would say, "It was enchanting to meet you..."
The word for today is awareness. In almost every section of the day, I experienced situations that caused me to reflect. First, during my morning Zumba workout, I was talking to my instructor after class and I started to tell her about JuJu. You have to understand that my instructor has a special light within her and she brings a wonderful energy with her. No matter what is going on with her personally, she invokes a very positive tone. I know it is one of the reasons people love her classes. Her high energy level and her power to connect with others, has always reminded of my friend who brought JuJu Gear to Minnesota and set up the Eden Prairie store. Anyway, I told her about a fashion show we are having this coming Saturday at the JuJu store and invited her to come. Funny thing was she already knew all about JuJu and was friends with someone else who works at the store! Awareness moment: The world we live in is so interconnected, much more than you can ever imagine. On the way to swim practice tonight, I flipped on the Christmas song radio station. Yes, it is officially that time of year. I love Christmas songs and each year I have to fight the urge to turn them on after Halloween. This year, I challenged myself to wait until after Thanksgiving. Sure I might have hesitated a little on one, as I selected radio stations, but for the most part I met my goal. So yesterday, the song "Sleigh Ride" comes on and I proceed to explain to Bella that all the instruments in the song are supposed to mimic a sleigh being pulled by a horse without using words. Yes, I know there is a version with words, but I'm talking about the classic instrumental version. Anyway, I tell her the bells are ringing as the horse moves, and if you listen closely you can even hear the "clip clop" of the horses hooves. She told me she could hear the bells, but no hooves. I told her to listen really close. Just as I was about to move on, thinking that with her implants she was unable to hear all the different layers in the music, she said, "Oh yeah, Mom! I hear the horse walking!" Awareness moment: Sometimes it just takes longer than you might anticipate for something to occur. It doesn't mean that it won't happen. Be patient. Tonight after swimming, as Bella was getting dressed, she was acting goofy and kind of crazy. I told her to hurry up, because I was tired and wanted to get home. Then she says to me, "I think this is the time that my concentrating medicine stops working." (She is on medicine for ADD). I was taken aback by her comment. It is never really a clear time of day when her Concerta wears off. We don't do school work late in the day, it is just usually swimming and then bed. But her self awareness of being able to feel the medicine wearing off, took me by surprise. She told me she feels more tired and foggy when it is wearing off. Awareness moment: All children (even the baby of the family) grow up and begin to become more aware of the inner workings of their bodies and minds. And that is a positive! It was a really good day! By the end of it I felt so energized. Having days like this are important to remember on others where nothing seems to go right! Two weekends ago, Bella participated in her first 2 day swim meet. It was a B/C meet sponsored by our team Foxjets, so Bella could attend, even though she doesn't have "C" times. The meet also had something else in it's favor, it was close. For all of you swimming parents out there, this is not new information, but boy do these meets start early. Warm ups were at 7:30am! Two days in a row! Now, we only live 15 minutes away, but there were people at the meeting coming from an hour away. Wow, that is some serious dedication to your child's swimming. I was a little nervous about Bella's attendance since she had been suffering from a double ear infection and pink eye, only a few days before the meet. The signups for these meets is weeks prior to the event, so it is never easy to plan. Anyway, she seemed ok the night before the meet started, so we were set. The second day we had to be at the pool even earlier, because I had to volunteer for concessions. It was nice to see her talking with friends and being social throughout the meet. Yes, she was the girl walking around with the aquapac bag on her head for her implant, stuck with a magnet on her swim cap, but kids seem to be used to it now and accept Bella for who she is. I am glad Bella accepts it, too. I can only hope as she goes through her teen years, she stays strong and confident about her differences. So even with having been sick only a few days before and the super early arrival time at the pool, Bella did GREAT in her events. On the 50 back she dropped 10.39 seconds and on the 50 free she dropped 7.39 seconds. The one downside at the meet is that even though she did well for HERSELF (which is how we always judge her times), we learned that at a B/C meet you only get ribbons if you are in the top 8 for your event. That was a bummer, but Bella took it in stride and realized that pride comes from the feeling you get inside, when you know you did really well, not from a ribbon. The other good news! Even though she still doesn't have C times yet, her Coach is really happy with her effort and improved performance so now she gets to swim in the second lane of her group, which is known as Level 2 bronze. Here is her swimming the 50 Backstroke. She is in the lane at the far left. This past weekend I did something I haven't done in several years. I went to work. I have been out of the workforce ever since I decided to homeschool. A friend of mine moved to Montana about a year ago and became involved in a company called JuJu Gear. They make super cute skirts by repurposing old clothes (mostly t-shirts, but sweaters, and other cute fabric is used as well). Anyway, about two weeks ago she posted that there was an opportunity to open a flagship JuJu store in MN, about 15 minutes away from where I live. 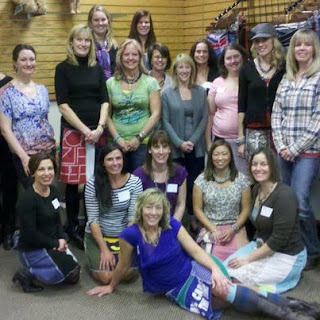 About 25 women she knew responded on Facebook that they wanted to help out/work in the store and just like that the store was staffed. I helped set up the store this past weekend and it looked like this. One of the cute things the store has is a "build your own JuJu skirt" station for American Girl size dolls and teddy bears. 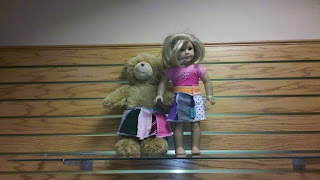 Little girls can come in and pick out some material and we will create a one of a kind JuJu skirt for their doll or bear. 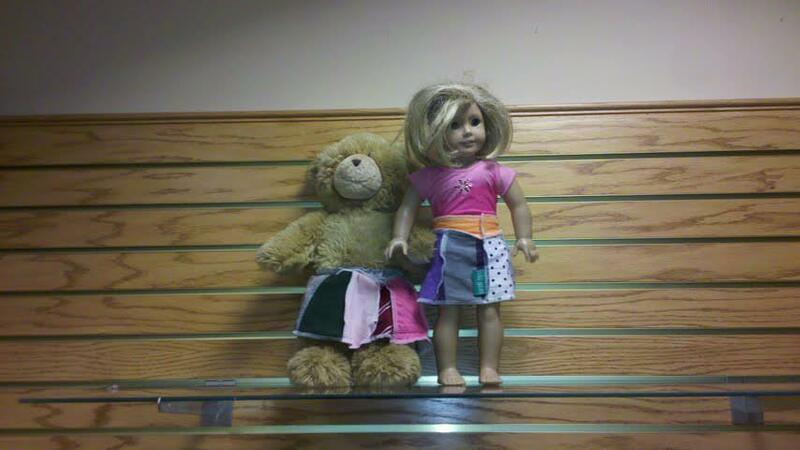 Bella gave me permission to bring one of her teddy bears and an American Girl Doll to the store to use as models. Here they are in their new JuJu. There are some great things about JuJu skirts. First, since they come from repurposed clothing, not one is like another. No one likes to show up somewhere wearing the same thing as someone else. Wearing a JuJu assures you never will. Also, we are saving landfills, one clothing item at a time. Oh, and they might just be the most comfortable clothing item around. They have elastic waists and the cotton t-shirts do not rub your skin. Finally, you can wear it any way you want. Wear it one day, then the next turn it around a little and it appears to be a brand new skirt! As an employee, of course I had to buy some new JuJu skirts to wear to work. Here's my latest ones. So if you live in or around Eden Prairie Center in Minnesota come check us out. Here's a picture of our super cute and lively staff. We can't wait for you to stop in and discover the world of JuJu. And if you don't live close to Eden Prairie, MN, that's ok. There's a way you can become part of the JuJu experience. 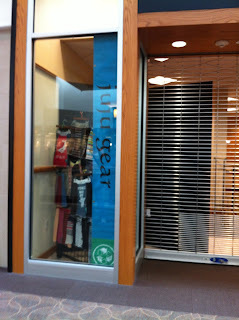 Visit www.jujugear.com. They have an online store and even better if you have some favorite tshirts lying around that might have a few holes, but you just can't let go of, well good news! JuJu gear can use those tshirts and make you a brand new customized JuJu skirt! So all those shirts from races you have run, or that drawer full of concert t-shirts can transform into what might just become your favorite piece of clothing EVER! This past weekend we attended my littlest brother's wedding. It was in Sioux Falls, which is about 4 hours away, so it felt like a mini vacation. It came with all the good and bad of a vacation; the packing, staying in a hotel, relaxation, the unpacking. It was fun to have the whole family together, but I have to say I was unprepared for some of the feelings that I experienced during the trip. One thing to note is that I am quite a bit older than my brother. Okay, 12 years if you must know. Anyway, he and his bride asked me to read a brief passage at the wedding, along with one of my sisters. I have to say that as I participated in the wedding rehearsal and the actual wedding itself, I was mentally transported back in time. 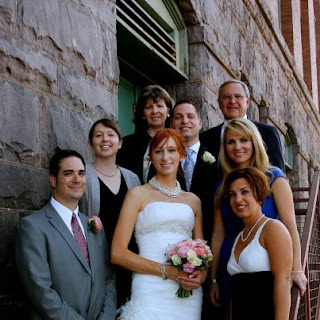 Seeing my baby brother, now an adult, getting married, was tougher than I had imagined. Images of him pushing away cereal as a baby while I tried to "airplane" it into his mouth or watching him sleep as a little toddler, sucking on his fingers with the label of his stuffed turtle, flooded my brain. I suppose it all stems from our nontraditional upbringing and the fact that at times I played the role of "Mom" to him, but it was something I didn't expect. I guess it can be a preview into the absolute mess I will be when my actual children get married. 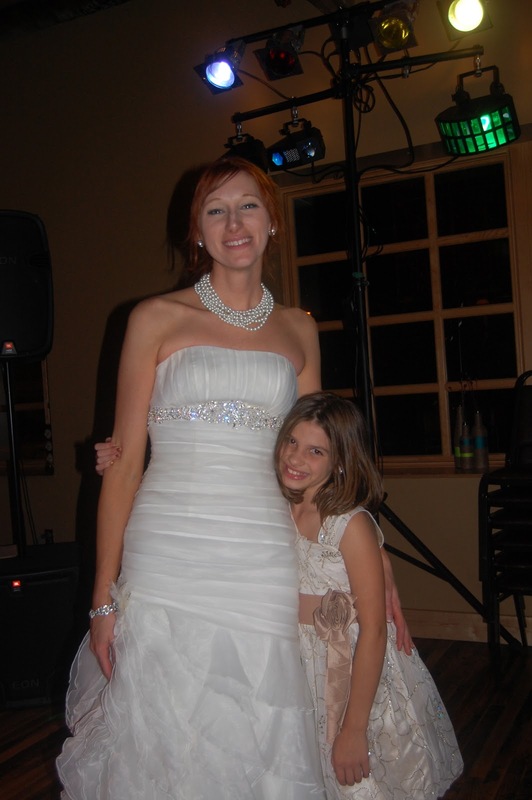 So in addition to the memories of the past at the wedding, new memories were made as well. Perhaps you've heard of the Korean rap singer, Psy and his breakout hit, "Gangnam Style"? Well, at the wedding I thought it would be fun to dance to it since we have been doing it at Zumba. It kind of became a one woman show, with people standing around watching me, rather than participating. At the end, my brother and his new wife participated too, with me as the leader. I felt a little like a street performer, without the added benefit of collecting cash after my act. Oh well, chalk it up to something I will remember for a long time. 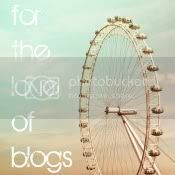 It feels a bit surreal to be writing a blog entry. Once again, I have lapsed and been involved in daily life. August kind of flew by for us. 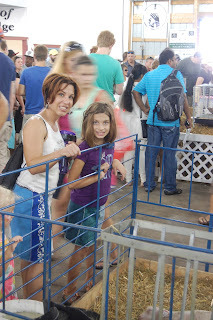 There was girl scout camp for Bella, illness that overtook members of our family for a week or two, my civic duty as a jury candidate, and the State Fair. Now we start back on a routine, just as I was getting used to the lazy days of summer. 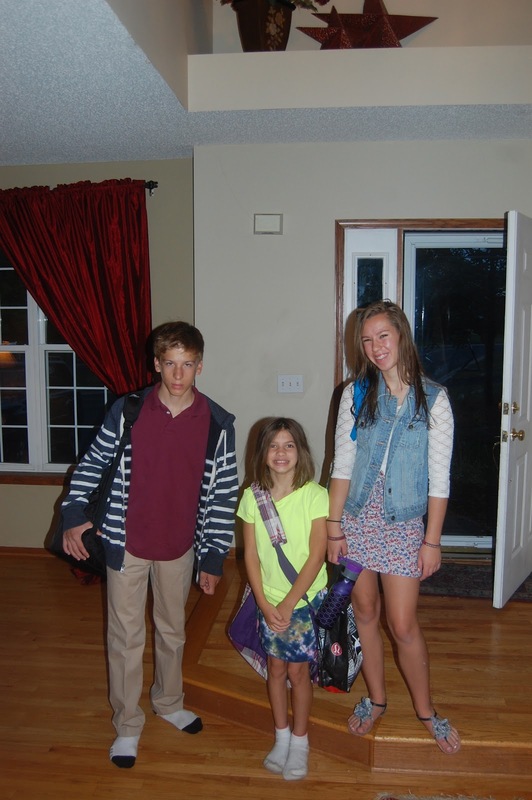 Harry started back to school last week, which was nice, as it gave a slight glimpse into our Fall schedule, without involving the whole family. There are always kinks to be worked out at the beginning of the year. Perhaps it is missed school supplies, a necessary change in schedule, or the ever popular "this is what time I have to wake up" adjustment. It always takes a good 2-3 weeks to feel fully back in the swing of things. This year I am still homeschooling Bella for part of the day. The plan is for her to go all day next year and assimilate in the special ed program mixed with regular lessons in the classroom. I do feel an extra pressure to "get her ready" and teach her a lot this school year, so she can be her most successful next year. In addition to the added pressure, her Montessori school has flip flopped their day for academics. In the past, they did a 3 hour study period in the morning, now it will be in the afternoon, after lunch. So Bella will go to school in the morning and come home after lunch for homeschool time. Not sure how this will go. I anticipate a lot of tired afternoons, but the plan is to do some work before she goes to school in the morning to combat this problem. Since returning to the school routine, we have already experienced a few memorable moments. Last Thursday, Harry got in the car with some bad news. He had thrown his retainers away after lunch in a paper lunch bag. Just another reason why using paper bags is bad for the environment. To clarify, he does have a reusable lunch bag that he did not have that day because he forgot his lunch at home and I had to drive it to school. Some background knowledge for you; a set of retainers retail for about $300.00. Don't ask me why, because I am pretty sure I could construct a new set from some Shrinky Dink material (reference for kids of the 70's and 80's) and a piece of metal from a spiral notebook. Harry did offer to pay for it with his caddy money, but as I drove home from the bus stop with him, I was no where near admitting defeat. I explained to him that we would be going back to school to search for the missing retainers. He started to complain immediately, telling me that he had looked for 45 minutes in the dumpster after he realized they were missing. I have to say, I was not discouraged by his claim of having already searched without luck. There have been many times I have asked him to find something in his room, been told it was not there, and then walked up myself and saw the item in plain view. Some things I was discouraged by: the temperature was 95 degrees outside, lunch had been over for 4 hours, and I have a sensitive gag reflex. The whole way to the school, I was criticized for my decision to return. We were let back into the school by the teacher that, funny enough, had monitored Harry's search the first time around. She said she totally understood my wanting to come back to search again, and freely admitted that she herself had been a part of "dumpster diving" missions of her own for her kids' lost retainers. So out to the dumpster we went, equipped with a chair and some disposable gloves. I wish I could accurately describe for you the smell that greeted us. All I can say is imagine the worst thing possible and add 300%. My motivation to find the retainers rapidly began to disappear about 2 minutes into the first bag of garbage I began to sort through, (gag reflex fully engaged) and $300 sounded like a super bargain. Then just as I was going to admit defeat (about 7 minutes in) it was like a choir of angels began to sing and from a place in the dumpster, a small halo of light. There was a brown bag with writing on it. I grabbed it quickly and nearly doubled over in delight as I read the name "Harry Rowe" in my own rushed handwriting. Mission not yet complete, I opened up the bag that was wet and torn, and prayed for one more miracle, that the retainers had not fallen out. I literally began to shout with joy as I spied the two pieces of plastic at the bottom of the bag! The teacher was quite amazed that we had found them! And it took less than 10 minutes! Truly, it was a meant to be moment. Was Harry excited? No, he said he could tell by looking at them that they had gotten warped from the heat in the dumpster and they would no longer fit. I will spare you the response I gave to him. This week we have been challenged by 25 minute morning showers. When everyone now has to get ready in the morning, this does not work. I have decided to introduce a handy egg timer to fix this. Here's hoping.